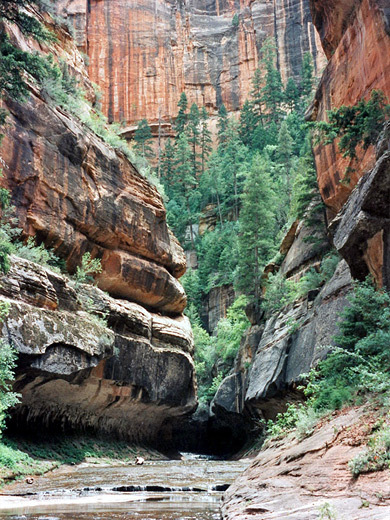 The Left Fork of North Creek is one of many small rivers that cut into the high plateaus in the backcountry of Zion National Park, forming deep canyons that are often wide and V-shaped lower down, but become quite narrow upstream, with sheer cliffs of Navajo sandstone that rise to heights of 1,500 feet. North Creek splits into left and right forks but the canyon of the former (also known as Great West Canyon) is the most spectacular and easiest reached, famous in part because of a feature known as The Subway, where the creek flows almost through a tunnel - a long, tubular passage with only a narrow opening above. 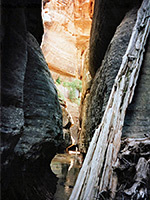 For some distance upstream, the canyon is very dramatic, containing smooth, circular potholes, deep pools, waterfalls and narrow channels. Two places require the use of ropes to ascend cliffs and continue up the canyon although most people only go as far as the Subway. Most of the walk to reach this point is along the side of the stream through a relatively wide valley, winding through trees and cacti; the narrow section is reached after 4 miles. The journey is moderately strenuous but very popular. A full exploration of the whole canyon is best done from the top, starting at the Wildcat Trailhead to the north, and descending initially alongside a tributary drainage (Russell Gulch). The lower trailhead is reached by driving 8 miles north along the Kolob Reservoir Road, a paved route that joins UT 9 at the small town of Virgin and climbs steadily, following close to the course of North Creek. There is a carpark with hike information on the east side of the road, two miles after the Zion National Park boundary, from where the trail begins. 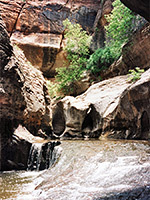 Left Fork of North Creek is within Zion National Park, and the normal admission fee (increased in 2005 to $25) is required although there is no entry station along the Kolob Reservoir Road. In addition, because the hike has become so popular in recent years, with a supposed risk of erosion and damage to wildlife, a limit of 80 people per day (and no more than 12 in a group) has been imposed, and a permit is necessary, which from 2004 has been 1-2 people: $10, 3-7 people: $15, 8-12 people: $20. Permits for 60 of the 80 may be booked in advance by either email or postal applications, 3 months prior to travel, with successful candidates determined by a lottery system, or for the other 20, obtained one day before travel from one of the two park visitor centers at Kolob Canyon or Zion Canyon. Early queuing is advised for these walk in permits. 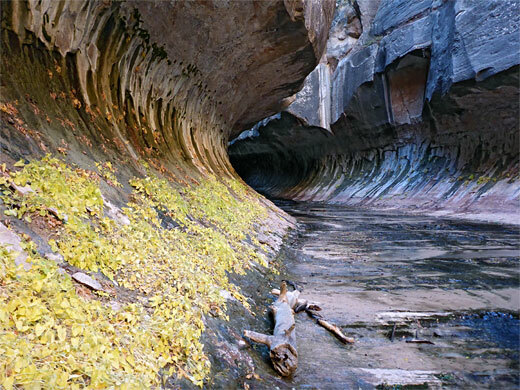 Zion backcountry hiking regulations change often, and may become even more restrictive. 11 views of Left Fork of North Creek. TopoQuest topographic map of Left Fork of North Creek. The well marked trail winds through a sandy area with bushes and cacti on the canyon rim for one mile, then descends steeply to the river. From here it is 4 miles upstream to the Subway. The route is initially on the south-west side, but soon crosses the river many times and is not always easy to follow. Often there are faint paths on both sides. 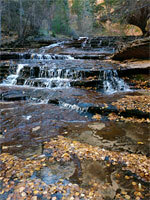 Although the river has occasional deep pools and boulders with little waterfalls, it is generally shallow, and becomes quite shaded with plenty of trees and bushes. The valley takes a while to become steep and narrow, but eventually the walls close in and the water covers all of the canyon floor. A sparkling whitewater cascade marks the start of the most scenic section, where the creek flows over a staircase formed by many thin rock layers, bordered by clusters of delicate wildflowers growing in sheltered alcoves at either side. The rocks hereabouts are covered with a thin layer of algae, making them extremely slippery. The Subway section is reached just upstream, formed at the boundary between two rock layers; the older Kayenta sandstone is softer than the overlying Navajo sandstone and so has been hollowed out to a greater degree. The Subway ends at a waterfall with deep channels and curious circular pools, from where the usual way to proceed is to climb the walls on the right, an ascent of 30 feet, to pass above the falls. This requires a rope; there is usually one there, securely fastened to the rocks, but this may not always be the case. A few hundred yards further the canyon narrows to a passage only a few feet wide with nicely carved rocks, pools over 6 feet deep and sheer cliffs at either side. This ends at another waterfall with a tiny arch at one side and a 3 foot deep pool underneath. To climb these falls requires another rope (not usually present) so this is as far as most people can go. Beyond here are more pools and boulders for half a mile, until Russell Gulch joins from the north, then soon after begins the path to the Wildcat Trailhead.